(91outcomes.com) - The U.S. Department of Veterans Affairs (VA) today published an interim final rule. effective today, extending by five more years the presumptive period for Gulf War veterans' service-connected disability claims related to undiagnosed illnesses and medically unexplained chronic multi-symptom illnesses. Several "examples" of qualifying disabling conditions are more commonly known as Gulf War Illness or Gulf War Syndrome, along with Fibromyalgia (FM), Chronic Fatigue Syndrome (CFS/ME), Irritable Bowel Syndrome (IBS), and Functional Gastrointestinal Disorders (FGIDs). Veterans with service in the Persian Gulf theater of operation between August 1990 and the present who have medical evidence of current and disabling multiple symptoms attributed to these disorders, or not attributable to another known disorder, may qualify for "presumptive" service-connected disability compensation and related benefits under the law. Earlier this year, VA announced it was proposing rules to extend the presumptive date "through 2018." However, the final published rule only extends the presumptive period through 2016, a full two years less than VA's earlier announcement. That announcement remains on VA's website. The VA press release is below, followed by the full Federal Register publication of the rule. 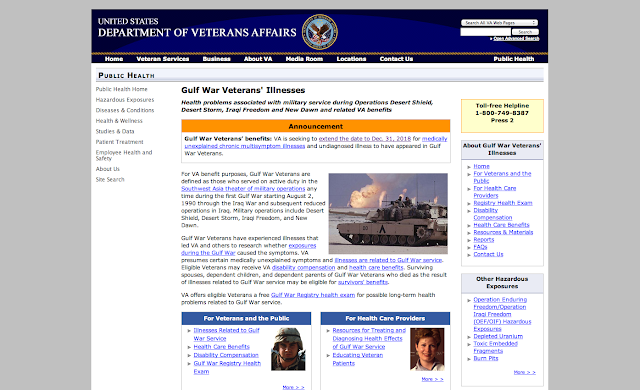 (VA PRESS RELEASE - WASHINGTON, DC) – Veterans of the Persian Gulf War with undiagnosed illnesses have an additional five years to qualify for benefits from the Department of Veterans Affairs. VA Said it was going to extend the Gulf War Illnesses presumptive period for service-connected disability claims by seven years (to 2018). Instead, VA only wound up extending it by five years (to 2016). What happened, VA?! LET'S GET THIS FIXED! AGENCY: U.S. Department of Veterans Affairs. Management (02REG), Department of Veterans Affairs, 810 Vermont Ave.
hours of 8 a.m. and 4:30 p.m., Monday through Friday (except holidays). more disabling during a presumptive period determined by the Secretary. veterans of the Persian Gulf War. from December 31, 2001, to December 31, 2006.
the Secretary may include under the presumption of service connection. 3.317 to reflect these changes. See 68 FR 34539, June 10, 2003. Congress. See 38 U.S.C. 101(33). consistent with the other follow-up report. provide additional information relevant to this issue in the future. evaluation period from December 31, 2011, to December 31, 2016.
final rule and will fully consider and address any comments received. of information under the Paperwork Reduction Act (44 U.S.C. 3501-3521). benefits, reducing costs, harmonizing rules, and promoting flexibility. to be a significant regulatory action under Executive Order 12866.
local, and tribal governments, or on the private sector. document on November 28, 2011, for publication. 2011'' and add, in its place, ``December 31, 2016''.